Tomorrow's flowers may produce blooms with a dazzling profusion of petals. That's thanks to research at the Plant Gene Expression Center, in Albany, California, where scientists have discovered the petal-producing prowess of a gene named—appropriately enough—Ultrapetala. Their work could eventually result in unusual new flowers for homes, parks, and offices. That should not only add new beauty to our surroundings, but also create attractive opportunities for growers and florists for new profits. Today, America's $11 billion floriculture industry is one of the fastest growing segments of U.S. agriculture. The Ultrapetala studies have yielded new clues not only about how plants form blooms, but also about how they form new shoots and other structures. All these plant parts originate from what are known as meristematic cells. These young cells grow rapidly, divide quickly, and eventually specialize, or differentiate, to form blossoms, leaves, or stems. Ultrapetala findings may also apply to crop plants like corn and soybeans. "Ultrapetala and some of the genes with which it interacts," says ARS plant molecular geneticist Jennifer C. Fletcher, "appear to be key players in the architecture of green plants." Fletcher leads the Ultrapetala research. 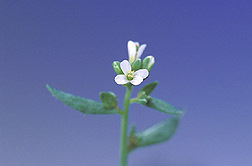 She did her experiments using thale cress, or Arabidopsis thaliana. This little plant—a relative of broccoli, cauliflower, cabbage, and brussels sprouts—has become the "lab rat" of plant biotechnology. One reason: Thale cress has less genetic material than most other plants. Its relatively small genome makes it somewhat easier for scientists to decipher the structure and function of each of its genes. In addition, A. thaliana is easy to grow in research greenhouses, using familiar nursery flats. It develops quickly from a seed to a fully mature, 8- to 16-inch-high plant in a mere 4 to 6 weeks. In her laboratory and greenhouse experiments, Fletcher has produced and investigated unique A. thaliana plants. Some have as many as 10 creamy white petals instead of the usual 4. Too, other structures differed, likely because of the interaction of Ultrapetala with other genes Fletcher is analyzing. The test plants, for instance, also boasted shoots that were wider and more numerous than those of everyday thale cress and produced more flowers. For these tests, Fletcher soaked A. thaliana seeds in ethyl methanesulfonate. That changed the makeup of the Ultrapetala gene. Then she grew several generations of plants from these seeds. This technique, widely used in modern molecular biology, can yield plants with significant internal and external differences. These differences can help scientists pinpoint the roles that a gene plays in its natural, unaltered state. A basic example from Fletcher's work: The chemically treated A. thaliana seeds produced plants with an altered form of Ultrapetala inside. All those plants had more petals than untreated plants. This strongly suggests that Ultrapetala has a key role in dictating the number of petals a plant forms. Fletcher designed other tests to reveal more about the relation of Ultrapetala to genes already known to affect key steps of a plant's development. She interbred her plants with experimental thale cress that had altered forms of these other interesting genes. 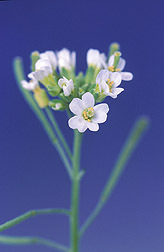 Those genes included Era1 (short for enhanced response to abscissic acid, a plant hormone); Pan (for perianthia, a botanical term); and Clv1, Clv2, and Clv3 (short for clavata, the clublike structure that these experimental plants form to enclose their seeds). She found that Era1 apparently shares some functions with Ultrapetala. They both regulate the number of green, leaflike structures—called sepals—that enclose the developing flower buds. Pan and Ultrapetala appear to have a common role in controlling the number of growing sites, or nodes, from which new flowers develop. Plants with altered Clv1, Clv2, and Clv3, when crossed with the altered Ultrapetala plants, yielded A. thaliana that had extremely enlarged stems. Investigations using high-tech scanning electron and confocal microscopes showed that these stems contained normal-size meristematic cells. But there were more of them, resulting in the added height and width. Ultrapetala and these genes, notes Fletcher, regulate where and how meristematic cells accumulate. That's how they control the size of stems, the number of sepals and petals, and other structural features. In new studies, funded by ARS and the National Science Foundation, Fletcher will investigate mechanisms called signal transduction pathways. Ultrapetala and other genes use these pathways to control the fate of cells, determining, for example, whether a meristematic cell will differentiate into a sepal or petal. Interest in deciphering these sequential chemical steps has heated up in the past two decades, but much more remains to be learned. "We know so much about how to grow a plant," says Fletcher, "but so little about how a plant grows." Fletcher's recent Ultrapetala findings and, earlier, her clavata work have been published in top scientific journals, including Science and Development. Additional details are available on the World Wide Web at www.pgec.usda.gov/fletcher/jfresearch.html. 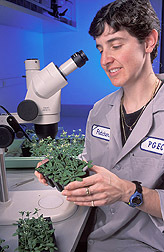 The Plant Gene Expression Center is jointly operated by the Agricultural Research Service and the University of California at Berkeley.—By Marcia Wood, Agricultural Research Service Information Staff. This research is part of Plant, Microbial, and Insect Genetic Resources, Genomics, and Genetic Improvement (#301) and Plant Biological and Molecular Processes (#302), two ARS National Programs described on the World Wide Web at www.nps.ars.usda.gov. Jennifer C. Fletcher is with the USDA-ARS Plant Gene Expression Center, 800 Buchanan St., Albany, CA 94710; phone (510) 559-5917, fax (510) 559-5678. "Petal Power: New Gene Yields Unique Blossoms" was published in the May 2003 issue of Agricultural Research magazine.